NANNING - Chinese Premier Wen Jiabao was meeting Monday with Southeast Asian leaders in the south China city of Nanning for a summit marking the 15 anniversary of the China-ASEAN dialogue relations. The talks were expected to focus both on progress toward free trade and efforts to keep peace in the region. ASEAN groups Brunei, Cambodia, Indonesia, Laos, Malaysia, Myanmar, Philippines, Singapore, Thailand and Vietnam - countries ranging from some of the most affluent to some of the poorest. Two-way trade between China and ASEAN, already expanding at a rate of nearly 40 percent a year, is expected to surge to US$200 billion a year by 2010, when the China-ASEAN Free Trade Area is due to be established. Last year, China-ASEAN trade hit US$130.4 billion, according to Chinese figures. Preliminary plans for the free trade area were set in 2002. The FTA will create a regional market of some 1.7 billion consumers and economic activity totaling more than US$2 trillion. Negotiations are still continuing on loosening trade restrictions for services industries. China's neighbors see obvious advantages in gaining access to China's massive market of 1.3 billion people, according to Ruan Zongze, vice president of the China Institute of International Studies. However, ties are still dogged by territorial disputes and other conflicts, he noted. 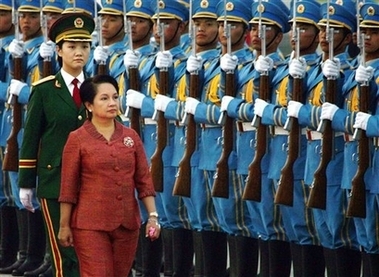 China fought a war with neighboring Vietnam in the late 1970s and has periodically sparred with rival governments over claims to oil and fish-abundant islands in the South China Sea. "The two sides, therefore, should promote mutual trust," Ruan said. The summit also marks the opening of an expo promoting regional trade and investment - an annual event held in Nanning, a city of 6.5 million that is the capital of Guangxi, which borders Vietnam. Nanning, once a sleepy sugar-trade center, has prospered as China's ties with Vietnam and other neighbors have expanded. The city's skyline is studded with construction cranes, and a brand new satellite city complete with a Wal-Mart Super Center stands near the expo site.